A comprehensive step by step tutorial on Ionic 4, Angular 6 and Cordova export and view pdf file using `dom-to-image`, jSPDF and File Opener. 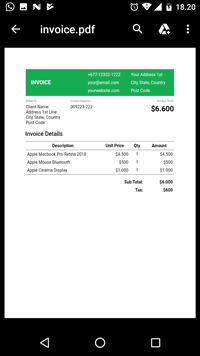 This Ionic 4 Angular 6 tutorial starts by displaying an invoice on the page with export to PDF file button. If you click the button, the Ionic 4 Angular 6 app will generate PDF file then view it in the File Opener. Before moving to the steps, make sure you have installed the latest Node.js and Ionic 4. To check it, type this command in the terminal or Node.js command line. Update Ionic Framework and Cordova to the latest versions. To create a new Ionic 4 / Angular 6 app, type this command. You will see questions during the installation, just type `N` for now. Next, go to the newly created app folder. Type `Y` if asking to install `@ionic/lab`. Now, the browser will open automatically then you will see this Ionic 4 Lab page. Add that module to `@NgModule` providers. Now, the File Opener plugin is ready to use on your page. As we mention at the beginning of this article, we have to create an invoice page that printable or exportable to PDF file. Open and edit an existing `src/app/home/home.page.html` then replace all HTML tags with this. Next, open and edit `src/app/home/home.page.scss` then add this lines of SASS codes. 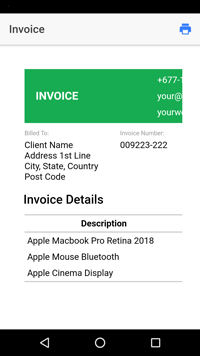 This time to make the Invoice exported to PDF file then preview using Ionic 4 file opener. Open and edit `src/app/home/home.page.ts` then add this imports. Add variable for loading controller before the constructor. Add a function for presenting loading controller below the constructor. Add a function for export and preview pdf file. Because we are using the Native plugin of Ionic 4 and Cordova, we should run on Device of Simulator to make the plugin working. Type this command to add Cordova platform. To run directly on iOS or Android Simulator or Device, type this commands. In my case, I've got this error when running on the Android device. To fix it, open and edit `platform/android/project.properties` then change this lines. You should see this page when it's running successfully.